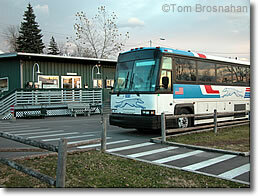 Vermont Transit bus routes from New York City to New England are now operated by Greyhound and Vermont Translines. Here's full information on buses in Vermont. Greyhound and Vermont Translines now operate all the routes formerly operated by Vermont Transit. Greyhound Lines and Vermont Translines operate all these services except for the Bennington shuttle to Albany NY, which is a service operated by Yankee Trails. Here's more on Vermont transportation. Greyhound is a major presence in New York City's Port Authority Bus Terminal. The old Vermont Transit bus station in Burlington VT, now closed. Buses start and end their trips at Burlington International Airport.